Camp Patton: Happy Mother's Day! One of the reasons for this blog, at least one of the reasons given when a certain husband expressed doubts about privacy/stalker issues surrounding sharing personal info on the internet, was that it would serve as a sort of digital baby book that our daughter and family could always have--just one mouse click away. Since you are reading this, you have probably figured it out already on your own--you have one great momma. Well, the truth is she has always been that way, ever since the day we had the pleasure of meeting you. When you wanted to have an all-night party that first night, it was your mom who happily stayed up and comforted you and rocked you to sleep. It's your mom who knows just how you want your blanket when you nap and knows when you're crying and it means you are hungry or tired or bored. No matter the circumstances--despite fatigue, sickness, or inconvenience, there is never a time she will not drop everything to make sure you are happy. 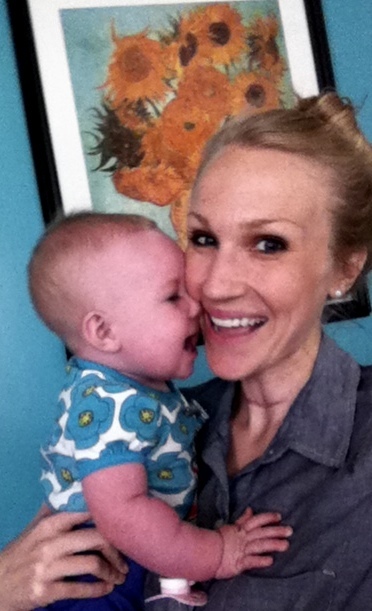 You have been teething recently, which has meant ample opportunities for her to show you just how much she loves you. One day you might be a mother too, and I hope you take good notes from your own mom, not just on sewing projects, or recipes, but on how she loves you. You will find as you go through life that there many ways to define what love is, but remember that true love is exactly what your mom has shown you since day one: selfless and self-giving. Since this is your mom's first Mother's Day, I know she is thinking about how lucky she is to have you, but the truth is that you and I are lucky to have her. Oh, this made me cry. This is wonderful! what a good daddy. and a good mommy. and a good baby. minus the teething.